Not great result when I am trying to USE fabric up rather than bring more into the house. I was very restrained last Friday when my friends and I went to the local quilt store. They bought fabs to use in the class we are taking in September. I decided I would revisit what I have in my stash. We're taking a class on Stack N Whack. Yep, we are behind the times but several of us haven't ever done one so the Guild is sponsoring it. I keep changing my mind about what fabric to use. Part of me would really like to do a 9 block halloween based quilt. But that means having to buy fabric. So, again, I need to look at what I have so I don't add even more fabrics! I've still got 6 weeks or so. Who knows what I'll decide. 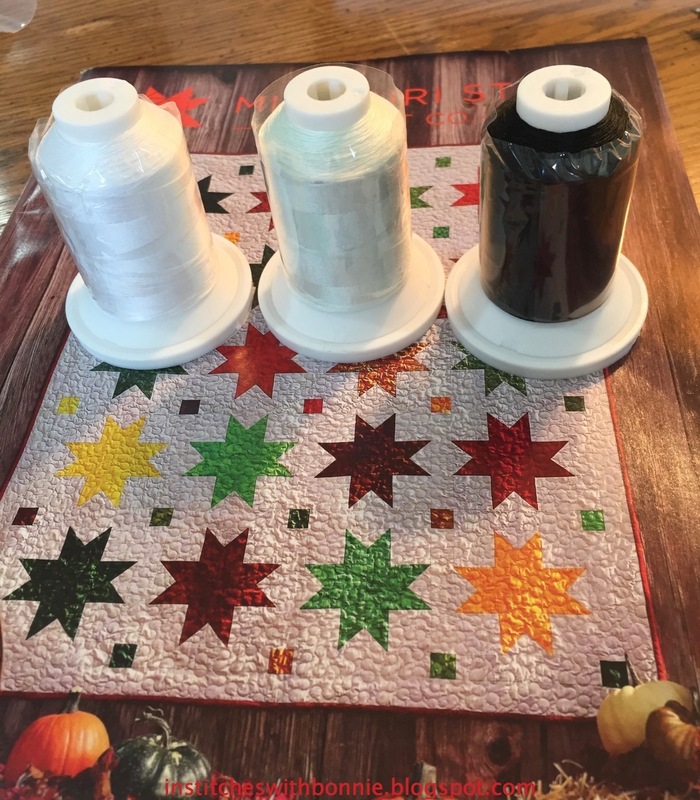 Did you get the new catalog from Missouri Star Quilt Co? Or do you get the daily specials? I jumped on the special for 3 spools of their new 50 weight cotton thread. Normal price for the "Trusty Trio" is $7.25. The special was $0.99. Even paying the $5.00 postage it was a pretty good deal and I threw in a pattern I had been looking at too. Haven't tried it yet but will do so soon and report back. I'm linking up with Needle and Thread Thursday. Great deal on the thread! I haven't seen the catalog yet, but I knew they were going to publish one. I'm anxious to get your opinion on the thread. For the stack and whack, I'm sure you'll be surprised to bring new life to and old favorite from your stash as it will look totally different! Stash depletion is a lot like dieting, it's really, really hard work! Still sounds like you are going to use what you bought, so hopefully it will go right back out.